Plus loads of vintage candy, too. 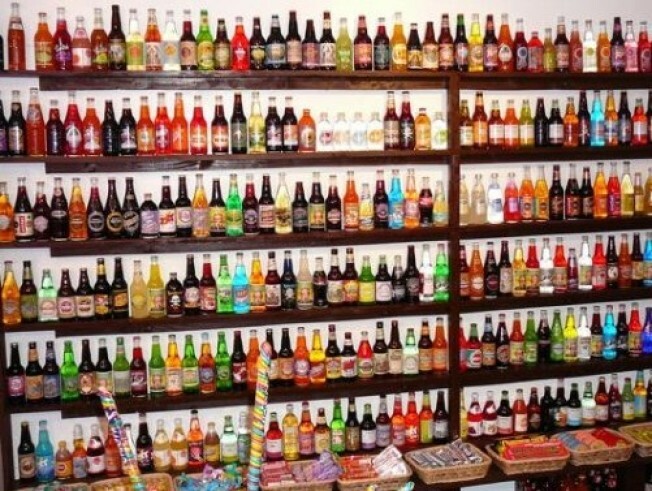 Rocket Fizz in Burbank sells sodas and candies with a rare and vintage twist. The holiday strut down Magnolia on Friday, November 20th, got us thinking of that bountiful boulevard and all its many offerings. Porto's, of course, and Monte Carlo and 8 Ball and all those fab costume stores and vintage shops. Add Rocket Fizz to the list. The store, which is devoted to vintage and hard-to-find treats, snacks, sodas, and savories, debuted in July -- there are a few more here and there around the country, including Camarillo -- and it has us thinking bubblegummy thoughts whenever we're in the area. Okay, within five miles of the area. Or we get to hankering for chocolate potato chips, or sour candies, or all the copious amounts of old-fashioned taffy in grab-'em bins along one wall. If you're a confection fan, or you're just looking for an offbeat host gift for the season, maybe for Thanksgiving, even, we recommend rocketing by for a big browse. It is so, so, so hard to leave the shop without buying just a little something. Prepare yourself. Find Rocket Fizz at 2112 W. Magnolia in Burbank.